Brittanys are charming, gentle and personable members of the household. Except for the Golden Retriever, you would be hard-pressed to find a more personable family dog. Lively and fun, Brittanys are always up for a roll on the carpet, a game in the back yard or a cuddle on the couch. Brittanys were bred as gundogs, and they definitely have birds on the brain. Although they're often called Brittany Spaniels, the American Kennel Club dropped the word "spaniel" from this pointing breed's name in 1982. The energetic Brittany is a versatile family companion and hunting dog who works more closely to the hunter than other pointing breeds. Great balls of fire! Life with a Brittany is never dull. This breed is smart, active, agile and relatively easy to train. For an active home with room for an active companion, you can’t do much better than the Brittany, a moderately sized dog with relatively few health or temperament problems. This dog can hunt, if that’s what you’re into, but for most people, the appeal is that the Brittany is athletic, bright and people-oriented. The name "Brittany" is taken from the Brittany region in northwestern France where the dog originated. Images of orange and white Brittany-like dogs hunting and retrieving game were first seen on tapestries and paintings from the 17th century. The first written and verifiable record of Brittanys comes from a hunting description written by Reverend Davies in 1850. He described hunting with small "bobtailed" dogs who pointed and were excellent retrievers. 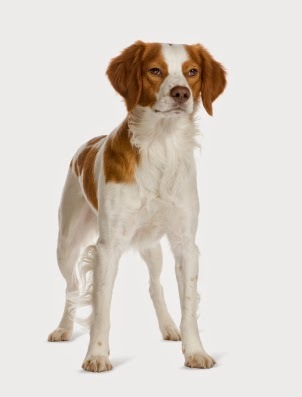 It was around the same time that the modern Brittany is rumored to have been bred by mating with English Setters. 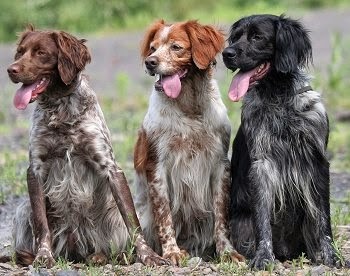 The Brittany was first shown at the Paris Dog Show in 1900. 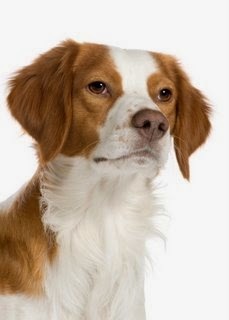 The Brittany was first recognized as a breed in 1907 when an orange and white male named "Boy" was registered in France. As a result, the first standards were outlined in the same year. 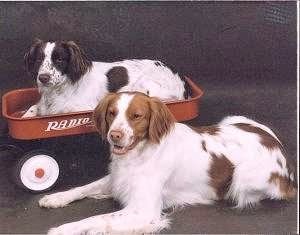 America recognized the Brittany in 1931 and the breed was approved by the American Kennel Club in 1934. In 1982 the "Spaniel" was officially dropped from the name. Brittanys are generally healthy and hardy dogs. The median lifespan for Brittanys in France is 12.6 years.A UK Kennel Club survey puts the breed's median lifespan at 12 years 11 months, with about 1 in 5 dogs dying of old age at an average of 14–15 years.Brittanys have no undercoat and need minimal grooming or bathing. However, their floppy ears tend to trap moisture in the ear canal and should be cleaned regularly. Diseases found in the breed include Hip dysplasia, with 14.9% of Brittanys tested between 1974 and 2009 by the Orthopedic Foundation for Animals displaying the condition, and a lesser rate of 10.3% for dogs born 2003-2004. The breed is listed among those commonly affected by Canine discoid lupus erythematosus. Epilepsy is also found, with owners of affected dogs encouraged to submit DNA to the UC Davis Veterinary Genetics Lab's ongoing project on Brittany and canine health. 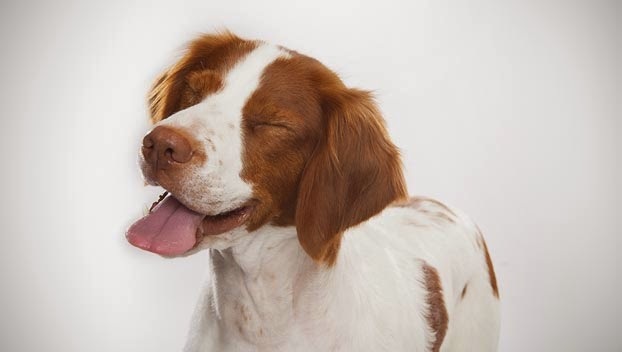 Mental and physical exercise are very important for the Brittany, as the breed is strong and tough by nature. One need not spend a great deal of time on coat maintenance, though. 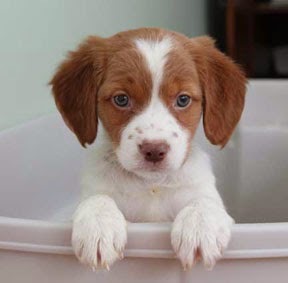 Brushing a Brittany dog once or twice a week is all that is needed. Brittanys are also quite adaptable to living in temperate weather outdoors. Protective Breeds: Right Dog For You?